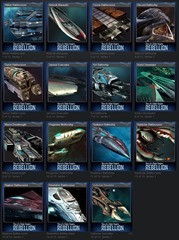 Some of you have noticed that Sins of a Solar Empire: Rebellion has added Steam Trading card support. If you aren’t familiar with the trading cards you can get an overview here. Here’s a look at the cards you can collect by playing Sins: Rebellion. How do you get all the cards? Im eligible for 8 drops out of 15. Trade, buy from the marketplace, booster packs. They look great! If anyone has a spare Kortul I have a Corsev Battlecruiser that is looking for a new owner. How do you trade them? I only see a sell option. You have to go to the profile of the player you want to trade with I think. Then you can trade anything in your steam inventory. Yeah, basically open up a chat window with them, from the down arrow by your name select Start a Trade (or some such). Anyway, i have no idea how to actually choose, which one i want. Apparently i am eligible to 8 out of 15, but what to do now? The pictures are greyish and i cant click them. EDIT: OK, i have absolutely no idea what to do. BTW it says i earned all those 8 card drops just by purchasing the game...how do i earn more? Clearly not by playing the game, as i played it quite a lot. yeah - the summer sale has me all into these cards as well. Happy to see more and more games adding them. Thanks for adding this, SD! You have to play after card support was added. There's only a certain number of card drops, then you have to obtain them by trading and such. Is there any certain action that gives the cards away? Should I give the AI a chance instead of stomping on it so hard? Does it have to be vanilla or can it be a mod? Nope and either. Just have the game running while connected to steam and you'll get cards. So I've noticed that there are Sins of a Solar Empire: Rebellion Emotes and backgrounds that come from making a badge set. Is a specific emote/background tied to each tier of badge or are they completely random?